Mario’s first turn on the Switch is fun, but lacks the innovation and creativity of Nintendo’s best. In the era of 3D video games, the Mario franchise set a benchmark for platformers with adventures full of clever details, exciting moments, and well-designed mechanics. Super Mario Odyssey continues the tradition on the Nintendo Switch with a bright, colorful entry that recaptures much of the fun gameplay that makes Mario endearing. But while the title suggests a daring, adventurous journey, the game itself is much more conservative than the medium-defining Mario games of past generations. Odyssey rehashes every Mario trick in the book. In the early stages of our review playthrough, it rarely stepped out of line to try anything especially new and different. The longer you spend with it, though, the better Super Mario Odyssey becomes. Beyond a somewhat simplistic rehash of the 20-year-old 3D Mario formula, Odyssey hides a more clever, interesting game that doesn’t really show itself until you’ve dedicated eight or 10 hours to it. It’s only once you’ve finished the game’s marginal story, and you venture back into its diverse world, that Odyssey becomes something really worth playing. Super Mario Odyssey continues the tradition of 3D Mario games, established more than 20 years ago in Super Mario 64. These exploration-heavy platformers transpose the original 2D Mario formula, expanding it into a huge 3D world. It doesn’t quite send Mario hopping across a galaxy of planets like Super Mario Galaxy, but it is filled with interesting, colorful and exotic locales, each with a distinct feel, and some unique challenges. Storywise, the premise is the same as always: Bowser, the giant, airship-owning king of the Koopas, kidnaps Princess Peach from her home in the Mushroom Kingdom, and Mario has to save her. 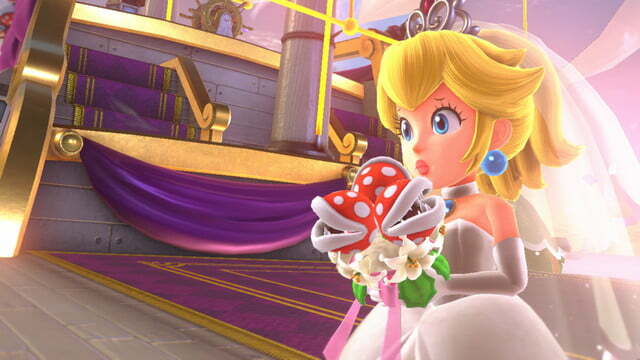 This time, Bowser’s forcing Peach to marry him outright, but he still has a sense of decorum. Bowser leaves the Mushroom Kingdom and travels to other kingdoms across the game world, each with its own cartoonish and fun themes and inhabitants, where he means to steal the items he needs to throw himself a good wedding. (Kidnapping is no reason to overlook tradition). All those different countries help set Super Mario Odyssey apart, including the first one: A kingdom populated by sentient hats. 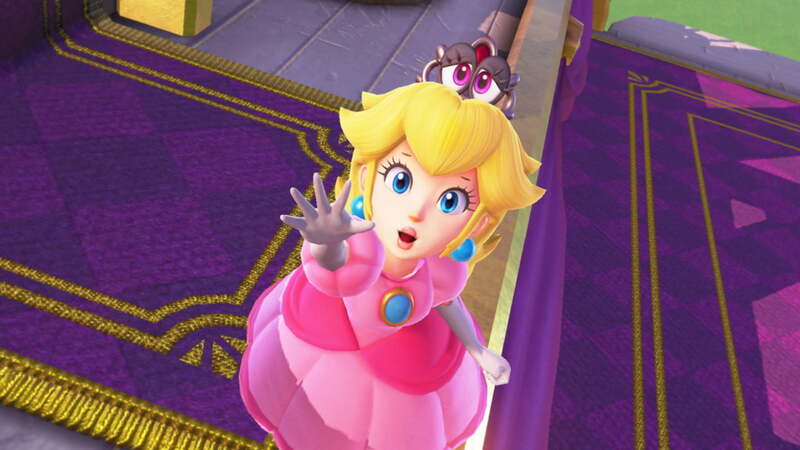 This time around, Bowser hasn’t just kidnapped Peach, he’s also nabbed Tiara, a sentient crown from the Cap Kingdom. Her brother, Cappy, joins Mario in his attempt to save them from Bowser, and helps him find an airship so they can follow Bowser around the world. While “Super Mario Odyssey” is fun, it can also be forgettable. To chase Bowser, Mario needs to find “Power Moons,” collectibles scattered around each kingdom to fuel his ship, the Odyssey. Like the stars of Super Mario 64, you’ll need to find a certain number of moons to open up the next stop on your journey. Moons are everywhere: You’ll find them in off-the-beaten-path locations, sitting on treetops, waiting as rewards for completing puzzles and beating bosses, and handed out by characters if you can manage to locate them. 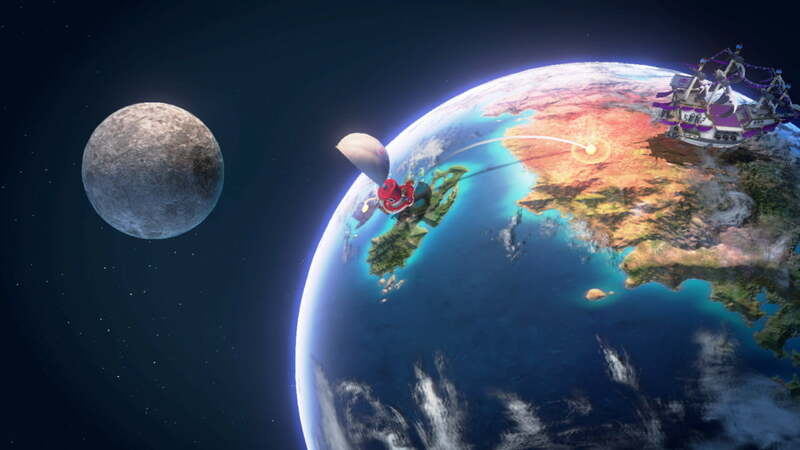 The game packs more than 900 such moons, and especially in the early part of the game, they’re pretty easy to find. Breaking up the usual Mario formula of running and jumping is Cappy, who’s both a sidekick and a special ability. Mario can toss his hat in front of him, which damages enemies, activates switches, and makes a handy extra jump platform. He also, for some reason, can “capture” creatures, allowing Mario to possess them and giving the player a new sets of abilities. The “capture” mechanic is Odyssey’s defining characteristic. 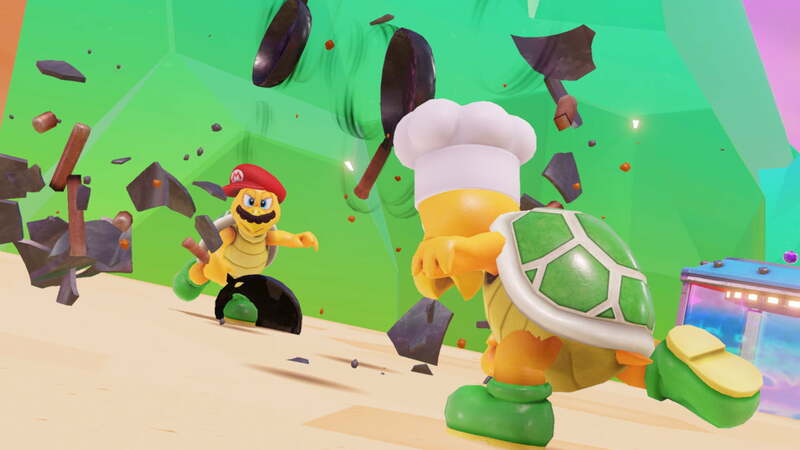 It spices up puzzles by requiring players to learn a new way of thinking about the game, and expands the sheer number of things Mario does throughout the journey. There are several boss fights players have to complete while controlling a particular enemy the whole time, and those inject some interesting variety into the game. While Odyssey’s hat-related mechanics sound good on paper, they ultimately don’t amount change much about the 3D Mario formula. Many of the game’s puzzles wind up feeling like a retread of Marios past. There is no idea from past 3D Mario games that Super Mario Odyssey doesn’t reuse. As a result, most Mario fans will have more than enough training to figure out every puzzle or challenge. More often than not, your first instinct is the correct one and the situation is obvious, because you’ve already done this before. Super Mario Odyssey recaptures the fun design and details that make Mario endearing. Cappy, too, is a cool idea in theory, but the concept never reaches its true potential. 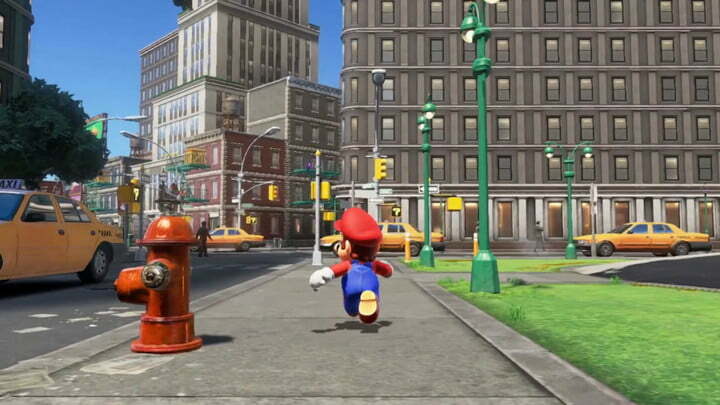 There aren’t really that many types of characters for Mario to possess throughout Super Mario Odyssey, and each one has pretty much a single use. In the sand level, for instance, there’s an Easter Island-looking creature wearing sunglasses. Possess it, and you can see invisible walkways in certain areas — but there are only a handful of puzzles that require the ability. You’ll always find the creatures you need standing next to the puzzles you need them for, and then discard them the second after you’ve accomplished the one thing they’re good for. This simplicity, at times, holds Super Mario Odyssey back. In its first outing on its new console, Nintendo seems too afraid to challenge itself or its players, and the result is a game that gets by on nostalgia and polish. While that sounds like a fatal flaw, these issues are far less pronounced when venture away from the doldrums of the game’s core story missions, and simply start exploring each level, chasing after its many power moons. 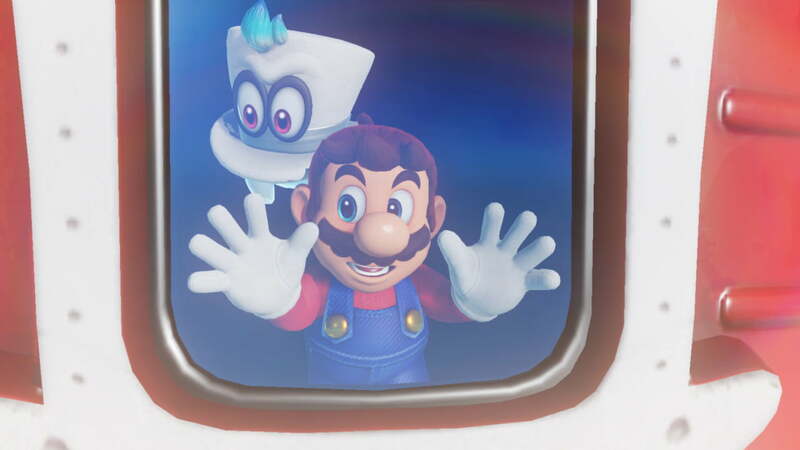 Past Mario games have excelled by giving players the freedom to explore, and with so many collectibles in the world, the vast majority of Mario Odyssey’s best puzzles and challenges are reserved for players curious enough to find them. While you can deviate from the story immediately, things open much more once Bowser is defeated and players can return to past kingdoms to hunt Odyssey’s ridiculous number of moons. Levels open up and shift after the story, characters spread out through the kingdoms, and there are glimpses of the clever, funny and weird design ideas that define the franchise. The deeper, more hidden challenges leverage each level’s unique qualities. Some of the moons are still simple to grab, but there are lots of challenging ones, and the combination of the two encourages players to get lost in each of the kingdoms and see everything they have to offer. Nintendo is known for well-polished, solidly made games, and Super Mario Odyssey certainly maintains that reputation. But it also plays very safe. 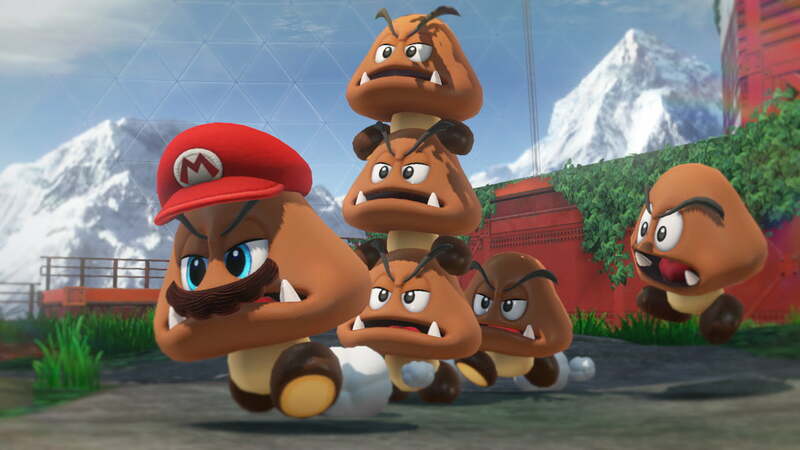 There are few tricks here that franchise fans won’t recognize from somewhere in the Mario library, and the new additions like Cappy don’t go very far. It makes Super Mario Odyssey ultimately more forgettable than previous entries. But while it probably won’t stick with most fans, Odyssey is still a fun return to Nintendo’s most storied franchise, and another good reason to make the plunge on a Nintendo Switch. The Mario franchise sets the standard for console platformers, and Super Mario Odyssey is the best fans of the genre can find. But Mario titles of the past, like Super Mario Galaxy, pushed the envelope more with the formula than Super Mario Odyssey dares to. With hundreds of moons to find, Super Mario Odyssey will keep most players busy for quite a while. We worked through the main story in about eight or so hours, but you can easily spend dozens of hours combing for every last secret. Even casual players will get a fair amount of game for their dollar. Yes. Super Mario Odyssey is a strong addition to every Switch owner’s library.